Perhaps you’ve begun noticing a strange rather alien looking vegetable appearing at your local supermarkets and farmers’ market. Some of you may even have received a few of them in your CSA (Community Supported Agriculture) box. If that alien vegetable looks anything like this photo, what you have, dear friends, is a celeriac, also known as celery root. Two popular ways of preparing celeriac include peeled, grated and eaten raw or peeled, diced and cooked with potatoes and mashed. Today I offer you a third way inspired by Israeli-British celebrity chef, Yotam Ottolenghi. 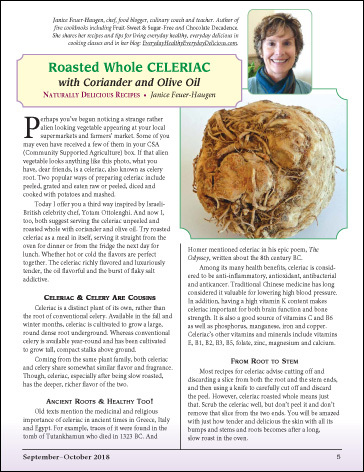 And now I, too, both suggest serving the celeriac unpeeled and roasted whole with coriander and olive oil. Try roasted celeriac as a meal in itself, serving it straight from the oven for dinner or from the fridge the next day for lunch. Whether hot or cold the flavors are perfect together. The celeriac richly flavored and luxuriously tender, the oil flavorful and the burst of flaky salt addictive.